I have a master’s degree in computer science. About half my career has been working on general software (like the Opal outliner and the built-in book reader for Apple Newton), and the rest on computer games (including paid gigs at Shenandoah Studio and GameHouse). I first started working with computers for money while in high school, though this was more keypunching and other operations-type things for the library and the school district than actual programming. I did some of that while in college. My first game writing was for the fanzine Alarums & Excursions, which was my initial connection with Robin Laws. I got into the overall game industry by writing articles and reviews for game magazines like Different Worlds and Space Gamer. This connected me with people like Greg Stafford and Forrest Johnson. I was also part of the community of Glorantha fans, both online and at conventions. That’s certainly how I ended up being able to do King of Dragon Pass with Robin Laws (he writes about our meeting at Glorantha Con 4). What was the first gaming product you worked on, and in what capacity? The first two digital games I made aren’t really products. I made an American football game while I was in middle school. My friend and I played it on the Olivetti Programma 101. You’d pick a play by running a secretly-chosen magnetic card though the reader, the defender would type something, and then the offense could type an “audible” to react. We had to keep track of field position and score separately, since each play was reprogramming the device from scratch via the card. And I collaborated with Forrest Johnson on a text adventure game which was probably too ambitious, and was never finished. I was the programmer, and Forrest did the text. We had a nice working prototype, but were trying to come up with a system that could handle almost anything. Basically, it was an engine for parser-based text games. How were you introduced to Glorantha? Technically it was because a friend and I were looking to play something together, and I bought a copy of White Bear & Red Moon. I’m not sure we ever did play it. I did send in the included postcard, and Greg Stafford sent back a copy of his zine, which expanded the game a little and had some information about the setting. I don’t think any of it really stuck (though I saved the copy of Wyrms Footnotes). 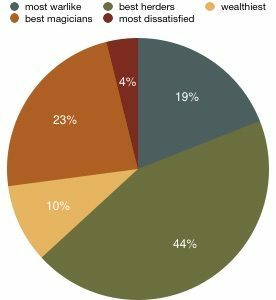 What inspired the format of King of Dragon Pass? Greg Stafford and I worked up the basic game structure, first by mail and eventually in person. For me, the big inspiration was the 1991 computer game Castles, designed by Scott Bennie. The basic game was about building castles, and defending them against attackers. There were also random interruptions, where you had to make decisions about minor crises, such as your workers being terrified by a werewolf. I found this more interesting than making castles and wanted to make this a core part of the game, rather than something that didn’t seriously affect game play. The Icelandic family sagas were a big factor too — plucky settlers farming and adventuring over multiple generations. I can’t speak for all of Greg’s inspiration, but I do remember on my visit he made a point of showing me the 1988 game Hidden Agenda (I recollect it as all green, though perhaps that was his monitor as screen shots seem to be white on black). While you’re also dealing with crises, the key element here was picking your advisors. It wasn’t much of a stretch to make this Gloranthan, picking your clan council instead of cabinet ministers. How did it develop from your first conception to the final game? The basic outline of King of Dragon Pass must have crystalized pretty quickly, because I think the final game is actually pretty close to that first conception. Obviously there were a lot of details that needed to be added, like the look of the Orlanthi, tribal negotiation, the scripting language, and heroic combat. But it always had advisors commenting on decisions that were linked via an economic model (which they also commented on depending on their expertise). In Six Ages, making sure the player knows what to do turned out to be a problem. One aspect of this was explaining the basics of game play. We’d come up with a nice system of contextual tips, but it wasn’t until we had people who had never played King of Dragon Pass try the game that we realized that the tips didn’t really give you an overview of how to play. Especially since several aspects of the experience are very different from other games. So we had to create a short scripted tutorial. The other aspect is that it’s hard to communicate the goal of the game when it involves something of a plot twist. In King of Dragon Pass, the name of the game tells you your objective. I tried to add as much foreshadowing and explanation as possible, given the constraint that it has to be conveyed in-game by advisors who don’t have any idea about the plot twist either. An alternate answer might be: bringing the game to more platforms. (In an area where we got lucky with King of Dragon Pass, we were unlucky, repeatedly.) Fortunately it looks like the current approach will succeed. What was the best part of the project? Making King of Dragon Pass was one of the great experiences of my life. I worked with some extremely talented people to create something that had never been made. Six Ages couldn’t quite capture that (for example, Greg Stafford had retired, and this was a essentially sequel rather than a groundbreaking game), but it was another chance to create a pretty special game. And once again I was working with some amazing talent. This was an opportunity I had been hoping to have, and it finally worked out. And it was a chance to make a similar game after having worked another ten years or so in the computer game business, and put into practice everything I’d learned since making King of Dragon Pass. Other than Six Ages or King of Dragon Pass, what’s your favorite computer game? That’s always a hard question! I’ve been playing them since the 1970s, which covers a lot of games. On the other hand, I’ve spent a lot of that time making games, which meant I don’t play them quite the same way most players might. These days I seem to spend most of my relaxation gaming on games that I can play away from my desk, and which I can dip in and out of. Two Dots on iPad is a tactile experience — but I doubt I would enjoy it on a computer screen despite very competent design. And I have been playing Fallen London in a web browser for years, for its great writing. I don’t know if it’s a factor but both of these have mechanisms that cap my play time, which might prevent burnout. I suspect my favorite is The Secret of Monkey Island, which was funny and well crafted, with a great soundtrack. And the satisfying ending was one of the inspirations for King of Dragon Pass. This year, we finished “Ride Like the Wind” and released it to the App Store. It’s gotten pretty good reviews, including making it onto at least three “best of the year” lists (Gamasutra, TouchArcade, Pocket Tactics). 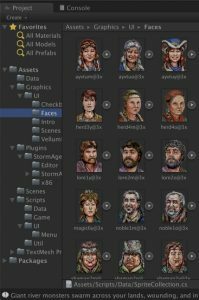 And players helped us find bugs, so we released 6 updates (also adding more leader portraits and treasures, and the possibility of becoming known as a weasel). The story of bringing the game to other platforms wasn’t as happy, though at least our first programmer did not perish from life-threatening medical issues. Our new developer has been making good progress, and we are still on track to release in 2019 (as we originally hoped). Although the game will be available elsewhere too, it helps visibility if you wish-list it on Steam. Our publishing partner, Kitfox Games, has set up a Discord channel where you can discuss the game. Other online resources include a wiki, a subreddit, and a “let’s play”. I spoke about Six Ages (and King of Dragon Pass) at NGS2018. And we began working on the second game, “Lights Going Out.” This will tell an entirely different story, continuing the saga of your clan generations later. Since the basic game system has been implemented, it’s already possible to get through a few game years. 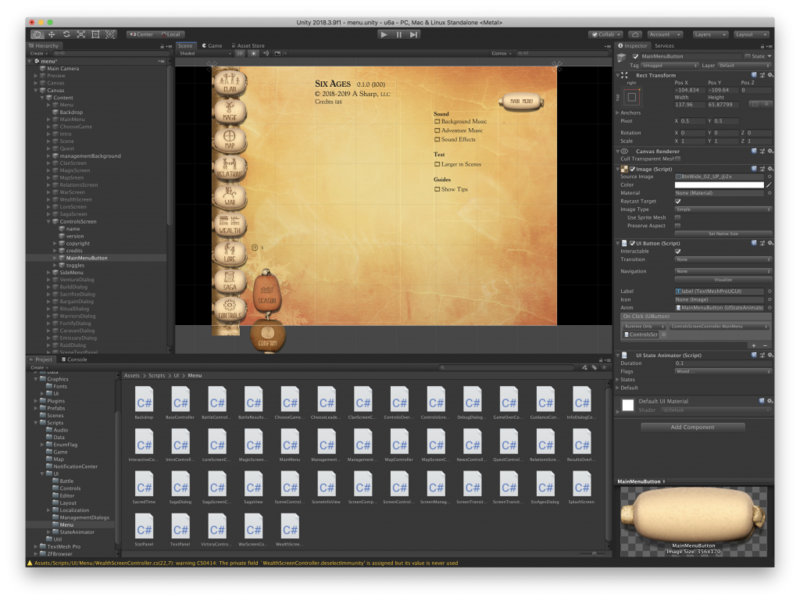 We’ve got 63 interactive scenes working (and partially tested), and 17 story illustrations completed. Six Ages is more than a myth or a legend — it’s going to be playable on Steam (hopefully)… but not as quickly as we’d initially planned. Unfortunately, the original programmer we contracted in the summer didn’t work out, and although he had to visit the emergency room a couple of times, he’s thankfully recovering now. But we have had to re-start the porting process with a new porting partner. We’re happy to be working with Rusto Games, a small outfit in Finland (three cheers for Finland!) who are big fans of King of Dragon Pass and Six Ages, which makes us big fans of them in turn. We aren’t sure exactly what the new release date is, but we’re hoping to hit desktops (PC and Mac) spring or summer 2019. You’ll be the first to know when we have more details. In the meantime, David and the team has been making lots of bugfixes, so it will be the most polished release of the game it can be. As they point out, the silver lining is that this gives us more time to find and fix weird edge case bugs (such as two random events occurring in a specific order and timing). Rusto Games has made significant progress, so I think we’re still on target for our promised date (see our FAQ): 2019. In the mean time, please wishlist the game on Steam, which helps get us visibility for next year’s launch. We’ve been moving steadily forward on the next Six Ages game, “Lights Going Out.” It’s in the production stage, and we’re busy creating scenes and art, extending the game design, and coding. The concept art process let me make a document to guide our artists, and we currently have 7 pieces of scene art complete. (Others are in progress.) And with six new portraits, you can almost assemble an entire clan council from new characters! There are over 250 scenes briefly described (e.g. “earthquake” or “flood”). 31 are now coded, and can be run. Other bits of game design are moving forwards as well, such as new ventures and magic. And there’s a new map. Since this is the second game in the series, there’s a lot that doesn’t have to be created. Although not enough is really working that you can play the game, you can at least run through a game year. The automated testing has a few rough edges (since some of the unit tests assumed scenes from “Ride Like the Wind”), but it’s been useful catching problems in the game so far. And the game is far enough along that QA can start exhaustive scene testing. Speaking of second game, the mechanics of loading a completed game and continuing are in and working. We’re taking note of various decisions and accomplishments that your clan can carry forward (though you’ll also be able to play without ever having played “Ride Like the Wind”). I think the biggest advantage of working on a sequel is that scenes can be up and running almost as soon as they’re written, so we can see how they work while they’re still fresh in our minds. There’s a lot less that you have to take on faith will work. It’s a very different game so even though we know scenes run, we won’t know how they all fit together for some time. But I’m encouraged so far. P.S. This work is not impacting the schedule to bring “Ride Like the Wind” to more platforms, and we hope to have an update on that soon. P.P.S. It does mean that fixing bugs in “Ride Like the Wind” has a lower priority, though that’s still happening. The new game needs a new map, so I thought it might be interesting to go over the technical process involved in creating a functional map. Six Ages (like King of Dragon Pass) divides the local map into zones (such as the Imther Mountains), as well as hexagons. Exploration reveals new hexes. Which zone you’re exploring influences the results (as with most things in the game, it’s not purely deterministic). 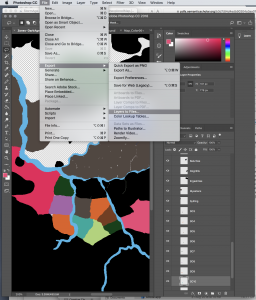 I draw each zone as a separate layer in Photoshop, giving it the name of the zone. 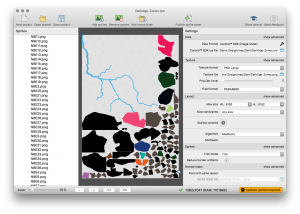 Then I use File > Export > Layers to Files to create separate PNG files. I actually do this twice, once to create trimmed images that can be used for hit-testing, the second to get the metrics of each zone. The command takes nearly 9 minutes to run on a recent MacBook Pro. to leave me with Vestantes.png. (This is an explorable feature, that requires crossing the Oslira River to visit. Once discovered, it’s labeled on the map.) There’s a bit of sanity checking in the game to make sure every zone has its feature data, which is useful during development (the data is spread between two files so that the geometry can be regenerated if something changes). To help edit this, there’s a special debugging mode which shows the connections. There’s some sanity checking code for this too, though it’s mostly a manual process. The first time through this, I noticed there were some stray pixels in one of the layers (and had to run TexturePacker again). But it’s a pretty straightforward process. The final step (before testing in actual play) is to make sure the number of exploration hexes is correct. The new map is ready to go, much earlier in the process than with the first game. Although it’s a bit of a gamble, I’ve begun working on the second game in the Six Ages series, “Lights Going Out.” This will continue the story of your clan generations later, as Chaos invades. Development is moving on three fronts. Robin Laws and I have been mapping out the overall story, and have a list of over 150 possible scenes to support it. A small art team is working up concept art for your clan (which has changed over the years) and several new cultures you may encounter. And I’ve started coding, to make sure that games saved from “Ride Like the Wind” can indeed be opened and continued. This is basically all preproduction. There’s no formal schedule yet, though given the scope of the game it will surely take at least a year of solid production work. But it looks as if things on all three fronts will work. 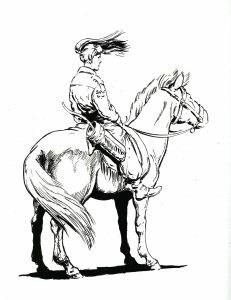 So I recommend that if you have completed “Ride Like the Wind,” you keep at least one game, so you can write the next chapter of your clan’s saga. P.S. This work is not impacting the schedule to bring “Ride Like the Wind” to more platforms. 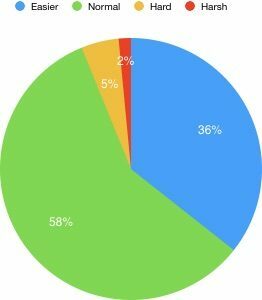 As you probably know, App Store reviews (and ratings) are critical for a “premium” game (one that doesn’t nag you about microtransactions), and even more so for an indie developer (without an ad budget). Many of you have written one, and we really thank you. One aspect of Apple’s App Store is that you can only see reviews from players who also use your country’s App Store. In other words, if you’re Australian, you can’t see what Canadians think. About 2/3 of our sales so far have been from the USA, and this may well be partly why (since Americans have plenty of reviews to check out, while Belgians or Danes have none). So I thought it’d be useful to let people see reviews from other countries. Here is a selection of unedited reviews, with their country of origin. Six Ages: Ride Like the Wind is an amazing game. As a successor to the 1999 release King of Dragon Pass, Six Ages brings back a similar, but refreshingly different art style to the classic mechanics long time fans love. Unlike its predecessor, Six Ages offers a more comprehensive and user friendly tutorial that makes the game much easier to get into, along with useful information that can be used throughout your games. I personally loved the music, art, and story the game offers, combined with the potential for more with the yet unreleased Lights Going Out and A World Reborn storylines. If you are a fan of King of Dragon Pass, or even games in the style of Banner Saga, I would highly recommend this purchase. A ore than worthy successor to the classic King of Dragon Pass. A different and unusual mix of gameplay that isn’t like anything else. It takes a lot to rouse me to write a game review. Six Ages is one of those games. 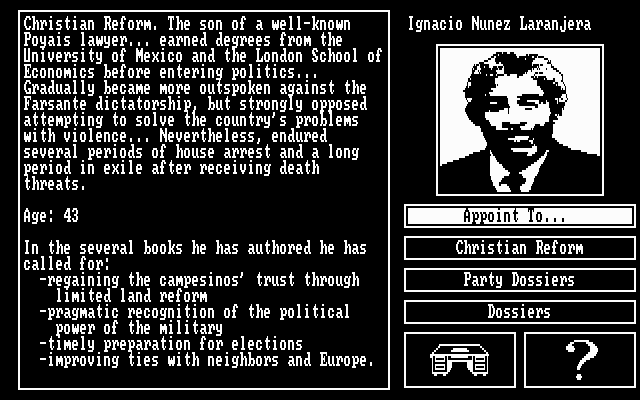 It’s a strange mix of management/diplomatic strategy and rpg. It’s a very unique experience that is at its best on a touch screen. Few gamed arenquite so beautiful and compelling. It’s very much worth the purchase. In a word with fewer reasons to own an iOS thing, being currently the only way to play Six Ages is a reason. Hard to believe Apple haven’t featured this one yet. 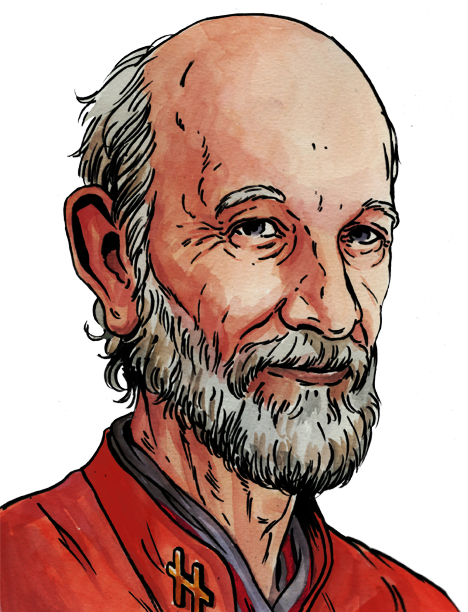 “I was thrilled to hear there would be another entry into the world of Glorantha, and Six Ages certainly hits the mark set by KODP. I also enjoyed some of the new mechanics and lore that add some more fun and depth to the gameplay. Some of the previous reviews critical of the difficulty and lack of baby stepping disappoint me. This game is designed very much with replay in mind. Make mistakes! Learn from them and do better next time! Part of what makes games like this much more fun than a plethora of other mindless apps I could name, is that your decisions have consequences! Often times there are no ‘right’ answers. – I love it! Six Ages is a wonderful and worthy successor to A-Sharp’s much beloved King Of Dragon Pass. A truly beautiful, breathtaking, immersive journey into Greg Stafford’s world of Glorantha, the new setting and mythology broadens and deepens its already-rich and engaging lore. Whether you’re a long-time fan of Glorantha or new to the world, Six Ages will surprise and delight you. Ride like the wind! This is the spiritual successor to the incredible game King of Dragon Pass. Everything about this game is top-notch quality. The world brought forth by this game has limitless possibilities – replayability of this game is through the roof. Highly recommended! Did you like King of Dragon Pass? Then you will love this game. I write books for a living and I found this as engaging, or more so, than KoDP. Plus, it does the full screen iPhone X thing. Just get it, and thank me later. “There is literally nothing else like this (well apart from King of Dragon Pass, which it’s safe to say if you liked that, you’ll love this). This game, and its predecessor KODP, is an amazing story driven experience that weaves all of your decisions together in unexpected ways. The has a lot of replayability as a result. You can feel the love and attention that the developers went to to bring a massive amount of text to life and to ensure that each scene complement each other. More than worth the cost of the game. Check out the reviews or let’s play and if you are remotely interested, try it. You won’t regret it. An even better game than KoDP! “For those that have played the cult 1999 game, King of Dragon Pass, Six Ages will feel like they’re coming home. The game system is almost the same, you still care for your clan by choosing advisors, making sure the people are content and fed, sacrificing to gods and raiding your neighbours. All of this is done with gorgeous visuals and sublime music. Players of KoDP will feel relieved when they see the improvement made in all these years. The one that stuck to me were the consequences that my actions made on the clan — whether on the number of cattle or morale of the people — clearly spelled out as I was making them. That’s important feedback that made me feel I had a handle on things even when disaster struck. If you liked KoDP get this game now! You won’t regret it! For those who don’t know anything about it: you’ll find rich narrative in a land far removed from ours where you’ll manage a small community trying to survive difficult times in an ever darkening world. Hi, I’m one of the lead developers of The Banner Saga. We were heavily inspired by KoDP, and I can safely say this is even better, bringing great quality of life improvements over its predecessor and improved combat while expanding on what made the original great. Everything about it is top notch and well worth your time and money. It is a minor miracle that this game even exists, buy it for crying out loud! Strategy, story telling, and fantasy that mixes bronze age mythologies into a fantastic game. 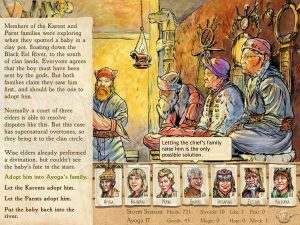 If you loved King of Dragon Pass, you will love Six Ages, and if you have not played King of Dragon Pass, no need, Six Ages is a stand-alone prequal. “Très grand fan de King of Dragon Pass, ça faisait un bon nombre d’années que j’attendais une suite de ce jeu encore inégalé et unique en son genre. Voilà chose faite. Six ages en garde l’ADN et les fondamentaux, mais ajoute des nouveautés intéressantes. Amateurs de jeux de gestion ? Vous n’avez pas peur du texte ? De la difficulté ? “More of the same formula as king of dragon pass but more fully realised depth and variation. Battles in particular have much more variation and varied outcomes. Epic! Also great to explore unknown lore of Glorantha. “To start off, I have been waiting for this game for a few years now! Having previously played KODP and hearing about I sequel I was exited! I have nothing but good things to say now that I have had it for some hours now. If you’ve played KODP then this will feel like home with the advantage of now feeling like you have more control over your tribe and the decisions made. However, this also allows for more strategy and therefore more trial and error. I am very satisfied with this aspect. This means that every game can play out in different ways and you can have different approaches. For those who are playing this as a separate game and have no KODP experience. This is an all around good strategy/management game. Lots of devastating events which makes for even sweeter victories. However, this game requires time and commitment to enjoy. You can sit down and expect a quick play through. The creators have clearly put a lot of TLC into making this and it requires the player to do the same to really enjoy! “Net als zijn voorganger King of Dragon Pass vind ik dit spel tot de absolute top behoren. All-time. Op welk platform dan ook. Bepaal het lot van een clan door beslissingen op strategisch, moreel en triviaal niveau. Geen grinding of oppervlakkige actie, maar een levende wereld, waarin je daadwerkelijk op kunt gaan. Dit is écht een rollenspel. Everything KoDP was and more! “King of Dragon Pass was the best game ever released for iOS. Emphasis on Was, now that SixAges is out; it’s everything KODP was – the charming artwork, the captivating mythic narrative, the humor, the sheer depth and size and complexity of the world and the gameplay…. I had only recently discovered King of the Dragon Pass on PC, and I was so pleased to find the sequel in the App Store. One of the few games worth every penny it cost to buy. Great replay value. Highly recommended. Durch die zahlreichen zufälligen Story-Ereignissen kommt keine Langeweile auf. Ein würdiger Nachfolger von „King of Dragon Pass“. “So many good things. If you want something different, a story driven RPG, a civilization management game, a game that lets you write the history of a people… look here! A worthy successor to legendary King of Dragon Pass. I really enjoyed guiding the destiny of my clan over generations through the mythical landscapes of the gods war. Fun to play, and with a genuinely affecting emergent narrative. I’m picky about games to invest in and took a chance on this one. I don’t think I ever wrote a review for a game but I had to say something for this one. The style of this game is very unique with this intriguing strategy concept. You nurture your clan like Civilization style play but are confronted with many “choose your path” scenarios that impact your growth. So many avenues to take to dictate your future. This is what makes this game strategic and compelling to challenge what you do. Give it a go! “So much to do in this game. Make sure you have enough food, watch your neighbors for raids, while hoping you’re doing enough to please the gods and build your economy. It’s like KODP but better. Great game! I love the new artwork, and the added complexity to this game. KODP was great but it lacked depth to the mechanics. This game fixed that. The new combat system is more interactive and fun too! Love the parley system and how your allies can send you gifts even without asking for a favor. Amazing game. One of the Best Strategy Games Ever? “I discovered King of Dragon Pass a few years ago on a website called Rock Paper Shotgun. It listed it as one of the best 50 strategy games of all time. I tried it and I had to agree, despite that it was made in 90’s. I have to say, Six Ages is in my opinion a superior game overall. They reduced the tedious micromanagement of fields, herds and crops and instead introduced a nice venture system, some family politics within the clan and also different types of tribes. The game is superbly written and in my opinion more challenging than KoDP. If only for the art and effort of the small team who made this, this would still be well worth the 10$. It is doubly worth the price given that it’s a masterpiece. 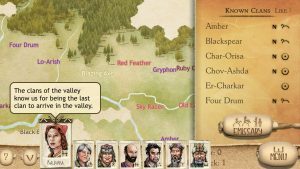 For those unfamiliar with King of Dragon Pass, Six Ages is the perfect amalgamation of a “choose your own adventure” story telling and resource management game. Don’t be put off by the price, it’s worth it. It’s also well adapted for mobile. Výborná příběhová rpg deskovo strategická hra. I loved Kings of Dragon Pass, 24 hours in this seems more involved and immersive. If a game can be complicated stimulating and accessible then this is it. Rich levels of detail and replay-ability, with ‘one more click’ fighting with the instinct to research about the issue your dealing with, plan the tribal objectives and deal with the unexpected. This is interactive fiction at its best, where the more you let your imagination be stimulated, the more rewarding the experience is. Great job, great game! “I don’t even know where to start for my love of this game it’s just that good! I guess I’ll start the art and music, the art for every scene is absolutely beautiful, I always look forward to new events to see what new stunning pieces of art I’ll see. The music also is just as amazing as the art, I personally absolutely love the battle music it makes me ready to face whatever threat dares strikes against my clan. Next all I’ll talk about clan management. At first it’s pretty daunting with all the different tabs and numbers but thankfully the tutorial is very well made helping you understand the basics pretty quick. Something I really like about Six Ages over King of Dragonpass are ventures. Basically ventures give your clan something to do for the year like expanding crop fields, training your troops, having your crafters work on exotic materials. What I like about ventures it feels like I’m a bit more of a leader, I mean I know you control what shrines are built, when to explore, who to fight, and stuff like that. It’s just nice having another thing to think about. What I also love about this game is how easy it is getting into the world and becoming immersed, the lore is so intriguing and the background on every race and culture makes me wish that as you learn more that new information is added to the lore tab. There’s quite a few races in the game like humans, elves who are actually plant people, dwarves who are made out stone, trolls who are boar people, spirits, and the gods. Humans so are really varied with many different cultures like the Riders (you), the Wheels culturally very similar to you but ride chariots and are very patriarchal, the Yeleni who are poor hunter-gatherers who worship a vulture god, Ergeshite who herd goats and worship two goat gods, and then finally the Ram people who worship a murderous thunder god and are the ones that destroyed your people’s empire. Few games make you as invested in the story. The people of your clan feel real. 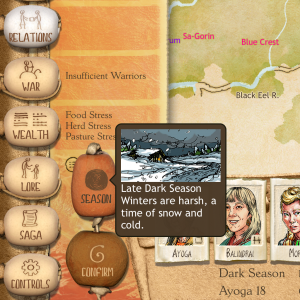 Six Ages streamlines the gameplay of King of the Dragon Pass. I especially like all the extra tips that explain mistakes more thoroughly. The magnificient art and music immerses the player deeper into the world of Glorantha. This game was made with so much passion. Completely lives up to King of Dragon Pass in every way and more. If you were ever into choose your own adventure games in your childhood, this game is a throwback to that mixed with the flair of epic fantasy storytelling. Seriously – the amount of writing put into this is about the same length as 4 Harry Potter books – and every single word is absolutely captivating. Well worth the price, well worth introducing it into your life. I haven’t played a game that made me feel like this since I bought Civ 4 as a teenager. You control this clan and it honestly feels like you’re playing as the conscious of a circle of elders. You grow with these people. You make genuinely difficult decisions. And you strategize in a way that almost feels like learning a song on the piano as someone who’s not particularly good at piano. You have no idea what you’re doing at first but you settle into this groove and you eventually become successful in ways that you don’t even quite understand. You grow with the game. It’s brilliant. Play it. It’s worth it. “My first instinct was to conclude the game was illogical whenever something I didn’t understand happened, but I’d always dig deeper and there was always a good reason for whatever had occurred. The game purposefully obfuscates information, you are a Bronze Age people after all, and I came to realize the game is ultimately the better for it. With that said I’m just going to leave my review like this and close with a 5* rating and full recommendation to anyone with a bit of patience. The game accommodates players of all skill levels and though it may at times seem illogical, you can rest assured the team has put thought and effort into every aspect of the experience. I was a big fan of King of Dragon Pass and love Six Ages so far! Excellent writing and emergent storytelling. If you’re like me and love history, strategy games, and good storytelling, check out this game! “An updated version of the unique gem that was King of Dragon Pass, it plays in a very similar way – wonderful stuff. Both games bring me all the way back to the ZX81 and the first game I ever played called Warlord (which was essentially a seasonal, turn based decision maker of a much simpler, text based variety, as befitting 1982) – nostalgic to the max! You guide your clan through trials and tribulations during seasonally divided years selecting clan leaders, managing farming, combat, building, trading and exploration. This plays out over years of turn based, choose your own adventure style, decision making, with the help of your clan circle advisors, as you navigate numerous stories and scenarios. Grow strong, keep your clan happy, learn lore, make friends and vanquish enemies. The game creates a wonderful atmosphere akin to Norse and Greek mythology. Honouring your ancestors is vital while appeasing and drawing on the all powerful, warring gods and lesser magical spirits. The settings and stories are varied and entertaining, it’s very satisfying when things go well (a combination of your choice and associated weighted chance). The art work deserves a mention as it enhances the atmosphere no end (tap any image to see it in its full, unobscured glory). “The game and setting are unbelievably unique. The game is more accessible than the amazing King of Dragon Pass, although that game revealed its victory conditions in a more satisfying way. 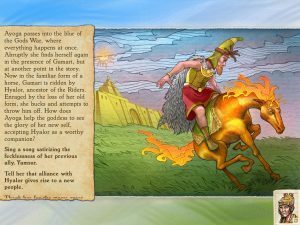 Six Ages: Ride Like the Wind was an attempt to recreate the magic of King of Dragon Pass, both from a game play sense, and from the personal viewpoint of a creator making something special with a great team. 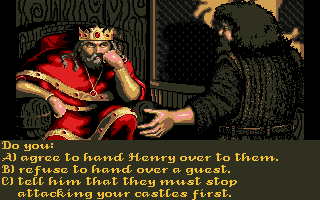 King of Dragon Pass managed to keep some people playing for nearly two decades. Making it was for me an amazing collaboration. 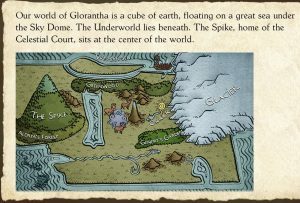 The game is a peculiar combination of narrative and turn-based strategy, drawing on the rich background of Greg Stafford’s Glorantha. The story is driven by making narrative choices, and held together by a politico-economic model that provides context and meaning to those decisions. And your strategic decisions can result in new narratives. The scope of the game is also unusual, in that you’re in charge of a small clan whose story unfolds over several generations. Individual characters advise you and execute your decisions, but they may die of old age before the game is over. This post originally appeared on Gamasutra. Here’s a postmortem of the development process. Why tamper with what works? Over its long life, King of Dragon Pass has sold nearly 200K copies. So Six Ages is a similar game. But we tried to improve the weaker areas and double down on the strong points. I’d already simplified KoDP a bit for its 2.0 reboot, but there were still fiddly bits like precisely allocating land use, worrying about exact labor allocation, and counting individual beans, er, Bushels of food. A new system of Ventures, or special tasks, lets you clear fields or pastures without worrying about the numbers. This mechanic handles a wide variety of economic chores, giving the player a lot of control over how to allocate the clan’s labor. And we now assume your clan knows how to feed itself, and you only worry about having a sufficient reserve to make it to the next harvest. Heroquests—reenactments of myths on the Other Side—are a unique feature of the setting. They are intentionally unpredictable, to be true to Greg Stafford’s writings. This often frustrated KoDP players. 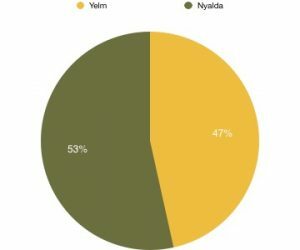 In Six Ages we made several changes in the ritual visits to the Otherworld, in particular providing an in-game explanation of what went wrong (for example, “She said she should not have expected Yamsur to help. All the stories suggested he wouldn’t.”). We also do something similar for failure in more mundane situations (“<testee> said Nyalda might have heard our pleas if we’d devoted more ritual time to pasture magic at Sacred Time.”). Your advisors have personalities, and we added new quirks (e.g. the Song Quoter and Xenophobe), and made sure that your clan council would sometimes talk to or about each other (since that was one of my favorite bits of KoDP). They may also initiate actions to further their own agendas. Under the hood, we rationalized how success chances were calculated, and came up with a flexible system of concerns, which are essentially ongoing modifiers to a leader’s odds of success or the economic model. This made emergent properties easier for the designers to understand, and helped explain things to players. Part of the formula was the mythic setting, Glorantha. We went all in on exploiting Glorantha’s rich background, setting the game in what KoDP regards as the age of mythology. Even though the game was in a less documented time and place, we still had a lot of Gloranthan lore to draw from. We added new details as needed, expanding on material written since KoDP came out. 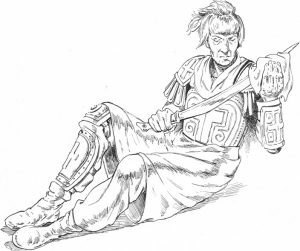 Greg Stafford, the creator of Glorantha, had retired and I didn’t really have the chance to work with him again. He did make some useful comments early in development. I was in close contact with Chaosium’s Creative Director, and we shared ideas and maps. You’ll find some of our art in Chaosium products. Once again I was able to work with extremely talented people. The Six Ages team was virtual, spread across many countries and time zones. I’ve never met most of them in person. But I didn’t need to limit my search for the best people to those I could meet with face-to-face, let alone share an office with. To stay in touch, I experimented with using Slack when we had a small group of concept artists. This turned out to work very well. (It certainly helps that so many people read and write English, even if it’s not their native language.) We didn’t end up with the same sort of cohesive team you can get when everyone is working in the same physical space but it still felt like a team. And once again, it felt to me like a great collaboration. Being able to work with members of the original team also turned out to be a marketing point. To leverage a very small QA team, I made sure they were supported by tools. A debug dialog allows viewing raw values, running scripts, or setting up unusual situations. Many debug scripts do the same, and when QA wanted a new one, it was always top priority so they could keep going. For example, they might need to turn someone into a shaman, or make a neighboring chief a woman. The scene compiler, which processes our custom scripting language, outputs a number of reports. They can be compared across builds, which made it easy to spot script typos. The compiler also output all text from the scripts. I’d periodically spell check this (which always made me come close to regretting that we’d included a personality quirk of inventing words). Other typos could be caught by automated tests. I created unit tests which did crude sanity checking of every response of every scene. These could be tweaked to check certain problematic situations, like having no wealth or friends. I never got this fully automated, but the tests did keep a lot of bugs from even getting to QA. Another tool was the ability to report issues directly from the game, on demand or after a crash. Reports include a detailed debug log which shows the scripts run, along with variable values. They also include two game saves (in case going back in time made it easier to reproduce a bug). We didn’t add playtesters until relatively late. They had the same reporting feature, and I added a bunch of turn by turn economic data to reports, to help tune the game. King of Dragon Pass came out when we didn’t have to worry about multiple screen sizes (both in its original 1999 release, and the 2011 iPhone edition). To handle phones as well as tablets and computers, we came up with a design that has two basic size classes. Each handles different screen sizes within the phone or tablet size class. (Tablets and computers have the same basic layout, though they’ll have other UI differences). This turned out to be very useful when Apple introduced an iPad with twice as much screen real estate as previous models. As much as possible, layouts within a screen are the same for both size classes. Small layout adjustments can be made by constants for finer-grained size categories. Although your advisors mention exceptional circumstances, we also show them in a dashboard associated with the screen-switching menu. The economic concerns mentioned earlier are the most common, but promises, opportunities, and transient warnings also appear in the dashboard. This gives a quick summary, which advisors can give more information about. KoDP’s tutorial was an attempt to show most parts of the game in one game year, but it tried to give the player as much freedom as possible and ended up very brittle. Rather than direct you through every management screen, tips now appear in context, so you can learn about a feature when you first encounter it. Playtesting revealed that this worked well if you were familiar with KoDP, but didn’t give you an overall sense of how to play. We added a very constrained tutorial at the last minute, which gives players an interactive introduction. Like KoDP, Six Ages supports VoiceOver, so blind and low vision players can play on an even footing with sighted players. We redesigned how exploration worked to be task focused, rather than literally trying to duplicate the experience of choosing arbitrary spots on the map. I never made a very detailed estimate, but figured the game would take about 24 months. It ended up more like 46. By comparison, the original King of Dragon Pass took about 33. Some of the slip was probably because I didn’t have any other programmers or producer (as I did with KoDP). And some of the freelancers couldn’t always work full time. But mostly it was a problem of not understanding the scope of the game. It was intended to be shorter than the long game in King of Dragon Pass. The original plan was 275 interactive scenes. It ended up with 412. (KoDP had about 600.) Although we knew we could drop things like the tribal negotiation scenes in KoDP, we ended up needing even more scenes for the victory track than KoDP had. We came in over budget as well, but only by about 23%. And that was still significantly less than the budget for KoDP. The lengthy development period made it harder to generate buzz, since the release date was so far away. We do hope that when we make the next game in the series, we won’t have to create all the infrastructure, and will have a better sense of what’s needed. We’d hoped to be able to release the game on more platforms relatively quickly. Unfortunately, third-party libraries we’d hoped to be able to use were either discontinued by the time the game came out, or couldn’t be used with the latest development tools. We’re currently working on a port, but it’s going to be much more expensive and time-consuming than we’d originally expected. The downside of working with freelancers is availability. Of course, an organization with employees can have turnover as well, but a couple team members left to further their careers, and several were constrained by other projects or caring for young children. In the end I don’t think this caused significant delays, but it was a constant worry. Even though the UI works well, one of our tradeoffs turned out to be problematic. Players often need to be aware of the current season. Although this was always shown on iPad, and easy to get to on iPhone, players weren’t always familiar with the Gloranthan seasons. In King of Dragon Pass, an illustration helped remind them. We eventually added a popup showing an illustration, but this wasn’t nearly as convenient. On the plus side, we managed to convey additional information (whether you were early or late in the season), and the dashboard probably was more important. Earlier playtesting might have caught this in time to rework the UI. Another issue that surprised us: a few players complained that we’d made the text too small. It turned out that they had large devices, and because KoDP wasn’t designed to take advantage of them, iOS enlarged the screen. These players were unhappy with the extra screen real estate they got because Six Ages will show more text instead. It turns out that when winning the game depends on a plot twist, it’s really hard to tell players how to win the game. Many players aren’t sure what to do up to that point. And if they fail to win, they often have no clue why. Not only that, but the overall game story is a bit of a surprise if you’ve played King of Dragon Pass. These factors also made it harder to do buzz, since there was a lot I didn’t want to reveal too early. For example, we couldn’t do open development like many indie studios do, because in a story game, there isn’t much else to talk about other than the story. And much of the art could also be considered to spoil the story, or at least a big PR splash at launch. We’re still in the middle of porting, adding new features, and fixing pesky bugs. But we’re encouraged by this response and hope to start working on the second Six Ages game very soon. I don’t think data-driven game design is the best approach to a narrative game, but it’s a valuable tool. It’s certainly worth gathering data to see if players are actually experiencing the story the way the designers intended. Unfortunately, it appears that in my eagerness to measure outcomes, I went past the design limits of Flurry Analytics, and am not actually tracking everything I thought I was. But I am capturing a lot of anonymous data, and I thought it might be interesting to share some of it. The clan questionnaire establishes the backstory of your clan. As usual, there is no best response, though a few affect difficulty. The questionnaire gives you an interactive introduction to the game, and lets you decide on how you want to play (these are the choices your ancestors made, and determine how they will react to your choices made in other contexts). Which of the gods did your ancestors favor? Players had no strong preference. 53% picked the Earth Goddess. Which famous event of the gods did your ancestors support? The most popular gods to help were the trade goddess, the warlike sun, and the cow goddess. Who was your ancestral enemy? Which god did your ancestors bring from the Golden City? 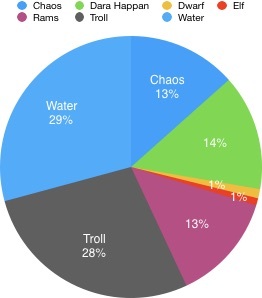 Apparently our players were keen to be master redsmiths, over half of them making sure to bring the god of bronze working as they fled their home. 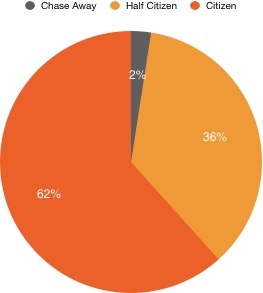 25% retained literacy. 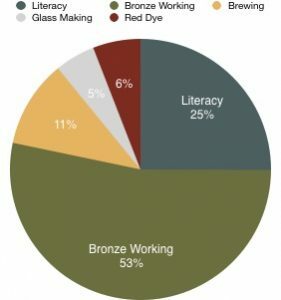 Only 5% brought the secrets of glass making, which I guess is represented in the artwork (other than the user interface, I don’t think we explicitly show any glass). Which group of the First Division were your ancestors? 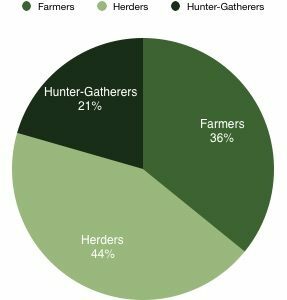 Given the importance of herding to the Riders, it’s not surprising that 44% of players decided that their ancestors were the best herders in the First Clan. I always figured that the most dissatisfied members were the ones who most wanted to split, but this isn’t a popular choice. Who did your ancestors meet in the Second Migration? 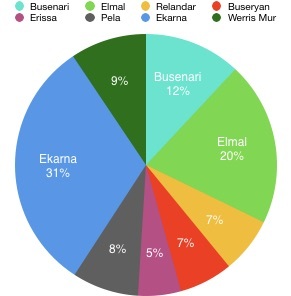 The most popular choice was herders, followed by farmers. Almost everyone adopted them, and most players made them full citizens of the clan. How hard will life be? The final question is primarily to establish your starting conditions. This is a difficult game, so it’s totally fine to start at the Easier setting. Most games were started at Normal. Probably players only play at Harsh once they have mastered things. Actually taking action can be tricky. I’m surprised that so few players chose dwarves or elves, but I think it would break the story flow to give them more equal billing (as well as presenting more choices than necessary at one point). Although I don’t think any of this particular data will result in design changes, we have been doing some tuning based on what we see. It may be subtle, but some of that will be in the next update.